Freezer Fudge — Erin Parekh | Live Well, Simply. A simple recipe to keep on hand when your sweet tooth needs taming. 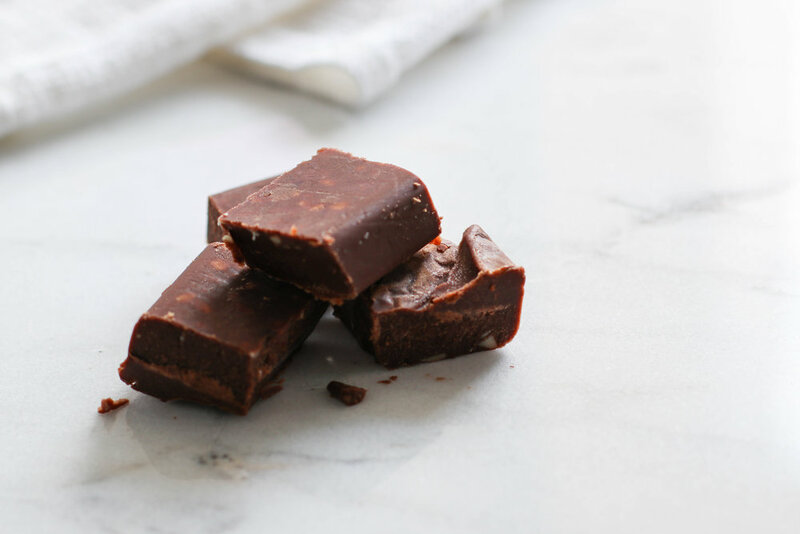 These fudge bites are loaded with healthy fats and a bit of protein to keep you satisfied and those blood sugar levels in check. Melt coconut oil and almond butter in a small sauce pan. Whisk in remaining ingredients until smooth. Pour into silicone ice cube molds and place in the freezer. Let sit for at least one hour before eating. The fudge will keep in the freezer (well sealed) for months, but it never lasts that long! This fudge will melt quickly at room temperature, so it's best consumed directly from the freezer. For a sweeter fudge, without sugar, try adding whole stevia powder (the green kind!) or a few drops of a high-quality liquid extract. If you don't have silicone ice cube molds (like I didn't when I took this photo), line a load pan with plastic wrap, pour in the fudge, and freeze until solid. Then, cut into small squares. These squares thaw very quickly, so it's best to eat them straight out of the freezer. Only leaving them sit for a minute or so to take the chill off.